In the previous article, we established the importance of listening to bird sounds. This article lists a few tricks to become better at remembering bird sounds. Familiarise yourself with the calls of the common birds. Reason 1: Common birds are common! Knowing common calls not only helps you pick out expected sounds better before moving on to other birds, it also helps you build a solid foundation to the call library in your mind. This library is of use in many places across the country, because most common birds are, well, common everywhere! Some good birds to start with are Common Tailorbird, Ashy Prinia, Coppersmith Barbet, Red-vented Bulbul, Common Myna, Rose-ringed Parakeet, House Sparrow, and White-throated Kingfisher. Most birds produce calls and songs of different types, for different reasons and at different times. Familiarising yourself with the range of calls of common birds found in your garden or local park can give you an idea of how varied vocalisations from a single species can be. The longer you hear the sounds of common birds around you, the more comfortable you’ll get with the idea of the “quality” of their vocalisations. This is a crucial step to identifying birds by sound. This could mean getting used to the pitch of the call (is it high like a bushlark’s song or low like a dove’s call? ), the quality of the sound itself (is it hollow like a coucal’s song or liquidy like a bee-eater’s trill? ), and the loudness and tempo of the calls. In the above example with the Common Tailorbird calls, note how the notes in each call are different but the “quality” of the sound remains consistent across the different calls. Basically, it is akin to identifying the voice of a familiar person – the words used by the person may change, but their voice itself doesn’t. Once you’re familiar with the quality of the song/call, what notes are being delivered become less relevant when you hear two calls that sound similar. For example, if you’re familiar with the metallic nature of a Racket-tailed Drongo’s call, then you are less likely to be confused by its mimicry. Similarly, if you are in the Western Ghats and hear a Rufous Babbler, you might be able to pick out that its call has a different quality to that of the Yellow-billed Babbler. Being able to understand this is also crucial in understanding sonograms, which will be explained in the next article. There are few better ways to learn bird sounds than by developing easy-to-remember mnemonics for the sounds you hear. When you focus on bird sounds, it makes a lot of sense to put down what you are hearing into words. These do not have to be sentences that make sense, or what everyone hears the bird as – but just a description of the sound (in words) that you can remember best! 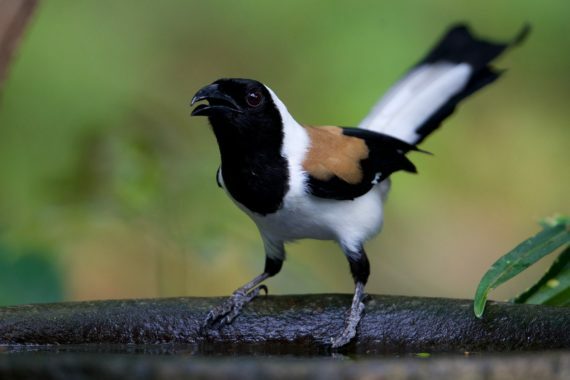 It could be a description – such as “the sound of a water bottle being emptied” for a Greater Coucal, “the sound of a ping-pong ball bouncing” for an Indian Nightjar, or a more rudimentary “chuck-chuck” for a Blyth’s Reed Warbler. It is entirely up to you, and it is most helpful when it is something you identify with. One example where mnemonics are often more powerful than even spectrograms is in the case of an Ashy Prinia. Below are the different spectrograms for the song of the Ashy Prinia – note how each looks markedly different to the other. And yet to our ears, all of them sound just like the usual disyllabic “jimmy-jimmy-jimmy” song that is common across most of the country. Important tip: It can be extremely worthwhile to count the number of syllables in a song/break a verse into syllables. For example, a Greenish Warbler’s call has two syllables (or is disyllabic) while a Green Warbler’s call has three syllables (or is trisyllabic). As with learning more things, practice makes perfect! You’ll get IDs by sound wrong from time to time but if you keep at it each time you are out birding, you’ll soon get the hang of it and surprise yourself when you begin identifying calling bird subconsciously! One trick that often works is seeing a bird call. Viewing a bird sing or call leaves a stronger imprint on the memory than just seeing the bird or just listening to it separately. The ability to associate the bird with its call is undoubtedly stronger when one experiences both together. Another way to begin learning the sounds around you is to start recording them. Just as writing something down helps us remember for longer, recording sounds on a device such as your phone can help you memorise songs for longer. You can also share your recordings by uploading them to your eBird checklists or to forums such as Xeno-Canto. Quite useful ! Shall use in my birding workshops. Simply Awesome . A good guide for beginners. Nice article. Very useful. Thanks for sharing. Loved the way it has been written! Very useful!